Government of Khyber Pakhtunkhwa recognizes the wide spread cross-cutting effect and influence of population factor on the overall development and the imperative to adopt a focused population policy with the aim and object of striking a balance between population and resources to be consistent with the development goals. It affirms the centrality of fertility decline to achieve the policy objective through timely completion of replacement level fertility (2.1 births) by 2032 and that the health and well-being of families and improve their quality of life. In line with International Commitment of FP 2020. Achieve universal access to safe and quality reproductive health/family planning services by 2020. Increase Contraceptive Prevalence Rate (CPR) from the existing level of 28% to 42% by 2020. Raise modern CPR from existing level of 20% (PDHS 2012-13) to 28% by 2020. Reduce unmet need for family planning from existing level of 26% (PDHS 2012-13) to 15 % by 2020. Raise contraceptive prevalence rate from 28% in 2012-13 to 55 % by 2032. Decrease total fertility rate from 3.9 in 2012-13 to 3.3 births per woman by 2020 and attain replacement level fertility (2.1 births per woman) by 2032. Reduce Annual Population Growth Rate from 2.2 % in 2013 to 1.3 % by 2032. Encourage increased investment for acceleration of female education and empowerment to facilitate attainment of population sector related objectives. Population Policy Khyber Pakhtunkhwa 2015, approved by the Chief Minister Government of Khyber Pakhtunkhwa. · Expansion in Service delivery network to improve accessibility of General Public to FP/RH services to address 26% unmet need of contraceptives (Newly established since 2012-13 include 220 Family Welfare Centre, 4 Mobile Service Units , 3 Reproductive Health Services Centre Type A. · Strengthening of two exiting Regional Training Institutes at Peshawar and Abbottabad, Establishment of a Regional Training Institute Malakand. and Purchase of Land for RTI A.Abad. · E-Governance, Networking and development of Soft ware’s for maintenance of Data Base on Human Resource Management system, Accounts Management System, Inventory Management system, Demographic Profiling and Unified Communication has been developed and staff trained. 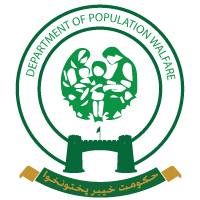 · Currently Demographic and health Survey is being undertaken in all 25 districts with the collaboration and under direct supervision of Director Office of Research Innovation and Commercialization Khyber Medical University to update demographic profile through Dy Demographers of Population Welfare Department.